The situation in Ukraine began escalating about a year ago when pro-Russian separatists started making more aggressive moves towards occupying Crimea and the Russian government didn’t oppose such actions with any enforcement. 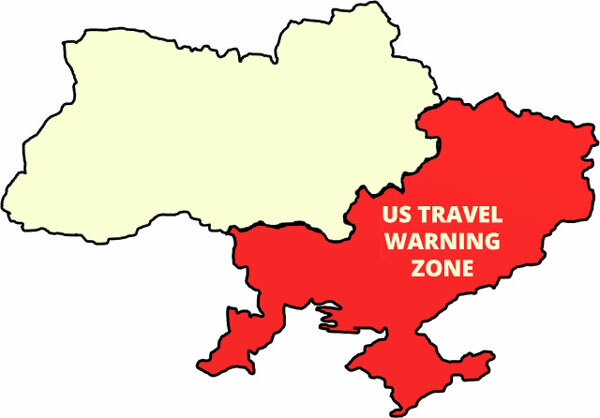 The Department of State declared a travel warning to Eastern Ukraine in August, 2014. This situation has the potential to disrupt or at least cause concern for those currently planning on immigrating to the US. US Travel Warning zone. CC commons courtesy of futureatlas.com on Flickr (modified). We have spoken with a number of customers who are uncomfortable traveling to Ukraine to visit their fiancee. Partially due to the travel warning, but also partially due to just the fear of being in a conflict zone. Some areas of the country are deemed unsafe for Americans, so it does have the potential to slow that process down if you are weary of traveling there, and if you haven’t met your fiance in person yet. Basically, the take home is that there don’t seem to be any official acknowledgement of any slowdowns. It’s essentially business as usual. It doesn’t appear that people from the conflict area are being denied at a higher level due to the conflict either. We have recently seen a slight decrease in fiance applications from Ukraine, however, it appears most of that is related to the US petitioner being too concerned to travel, or people are changing their plans based on how the conflict is affecting them directly. What it does not seem to be happening is the conflict directly resulting in increased denials or technical delays. I need to get a Visa to travel to Moscow Russia leaving the US April third or fourth 2015 returning to the US April 10 to 12 2105, How much is the cost and how long does it take?? Your response is greatly appreciated!! I have my passport, just need the Visa and the invitation!! I have just returned from kharkov Ukraine two days ago. Everything was quiet and had a wonderful time meeting my lady friend. I went through an agency called Altenda who provided a beautiful apartment, interpreter and car and driver. I t was quiet there and I felt safe. I was in Kiev, Kharkov, and Melitopol in January 2014, I traveled again to Kiev and Kharkov in September 2014,and I was in Kharkov on in Dec 2104, with my 13 y/o daughter to get married.